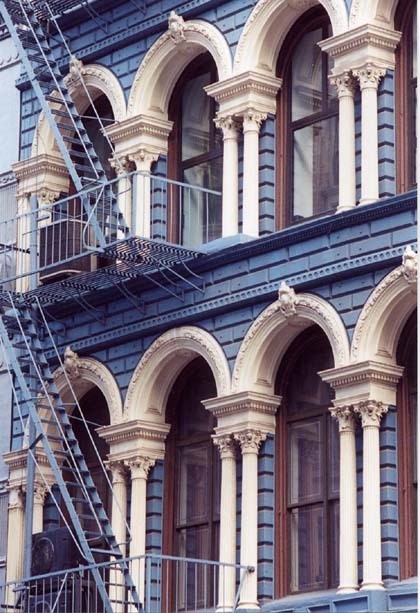 If you’ve ever visited New York City or you live there, you may know about the cozy, cobblestoned section of the city known as Soho. It lies in Manhattan’s downtown section and is close to Greenwich Village, Little Italy and Chinatown — all within walking distance. In the 1800s, Soho’s (south of Houston Street) residents were primarily middle-class and elite members of society and at one time, Soho had more bars and brothels than any other section of the city. It still has bars (brothels, I have no knowledge of), but what it is now is a trendy place that has a village vibe (and some of the most expensive real estate in Manhattan), filled with cafes, restaurants and fashionable shops selling expensive wares for the home and body. But, there are some bargains to be had and lovely, tree-lined streets to explore. That’s what we did and a lot of walking, to take it all in. The Hampton Inn on 54 Watts Street is where we stayed. It’s in a prime location (subway is about two blocks away) and on a quiet street within easy walking distance to all the action that is Soho. The rates are great (for Manhattan, especially if you book in advance) as are the rooms and staff. They’ve got a nice terrace to take in city views while enjoying a glass of wine or two as the sun sets. The architecture is phenomenal and some of the buildings from Soho’s industrial/commercial period (textile and rag-trade) still stand. Cast-iron is predominant here as developers used it to construct these large warehouses, several of which have been converted into multi-million dollar condos and cool, uber-expensive shops (Dolce & Gabbana and Prada to name a couple), but you can find shops that carry last season’s designer clothing at drastically-reduced prices (Soho Trends at 386 West Broadway). For even more budget-friendly wares, you can take a stroll to Little Italy or busy Chinatown, where walking becomes a bit more difficult as those shopkeepers barrage you with invitations to view their knockoffs. Still, it’s worth visiting, to just browse. 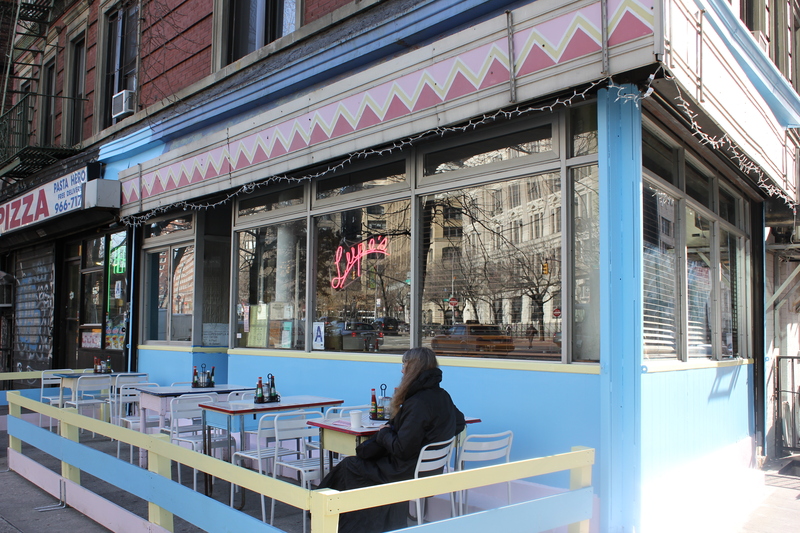 In Little Italy, there’s several cafes with the doors open, people dining alfresco, pets with their owners taking time out out for a cup of coffee, a meal, a glass of wine. 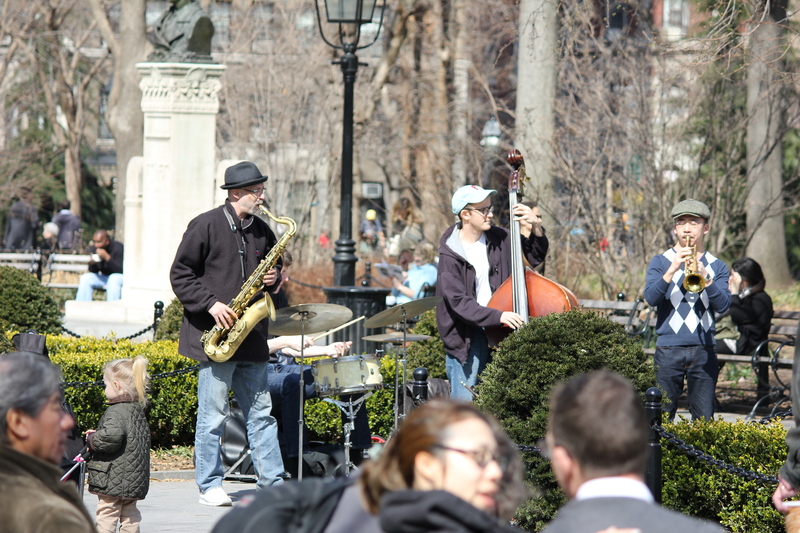 It was a beautiful, perfect and sunny day when we went (about 70 degrees) and everyone was out enjoying the day. 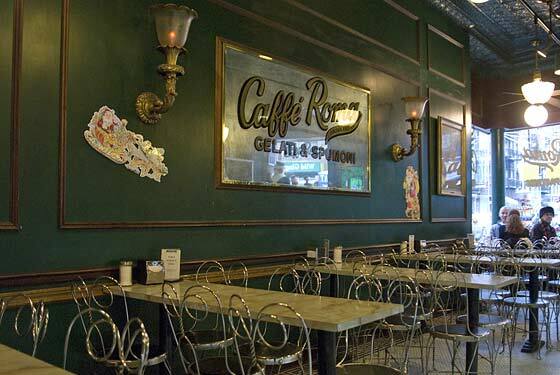 For a sweet treat and cappuccino, try Caffe Roma on 385 Broome Street, an Italian Bakery that has bistro tables and a full case of Italian pastries. New York University is a short walk away as is Washington Square Park where you’ll find old and young alike enjoying the park, local actors/entertainers (take a look at the pic below, this girl must have done this hula-hoop performance for at least 45 minutes!) 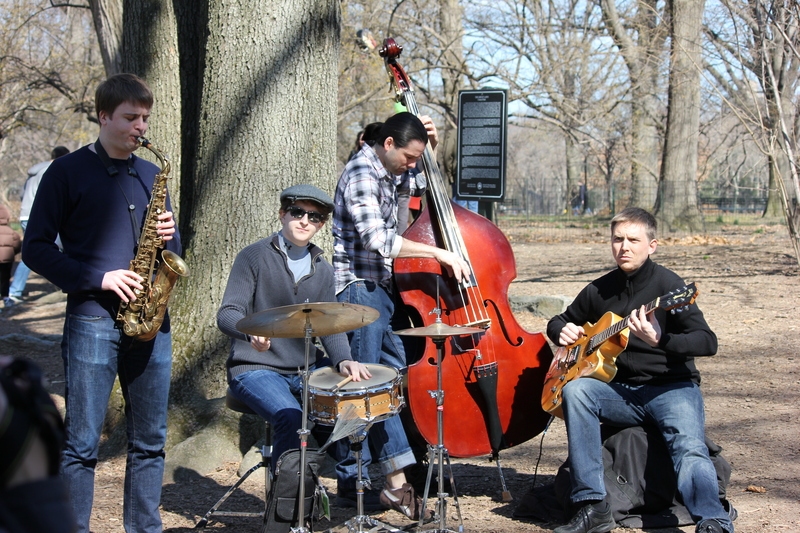 or musicians playing a few tunes. For a great, inexpensive lunch, try S’mac where you can get some comfort food – mac and cheese made in every conceivable way. (My favorite is the Parisienne with figs, Brie and rosemary). The “nosh” size is about seven bucks. 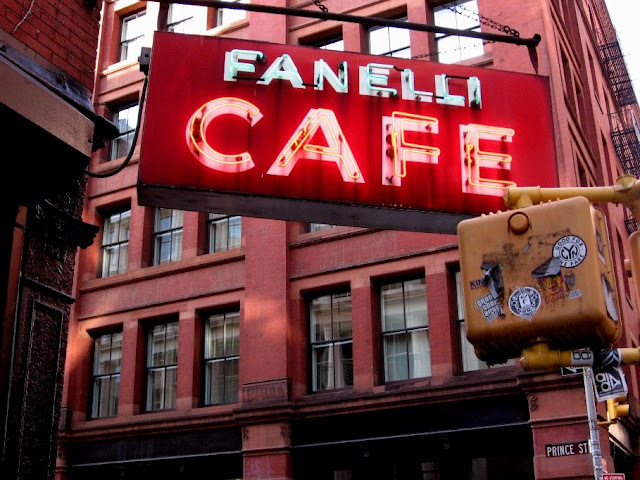 We also ate at one of Soho’s oldest bars, Cafe Fanelli’s which has a pretty good fish and chips dish (my husband had the Shepard’s Pie). The service is slow but it’s a nice atmosphere with a cozy, pub-like ambiance. For dinner one night we tried Lupe’s which was across the street from our hotel. It’s authentic Mexican in a cozy, dark atmosphere with very decent prices. 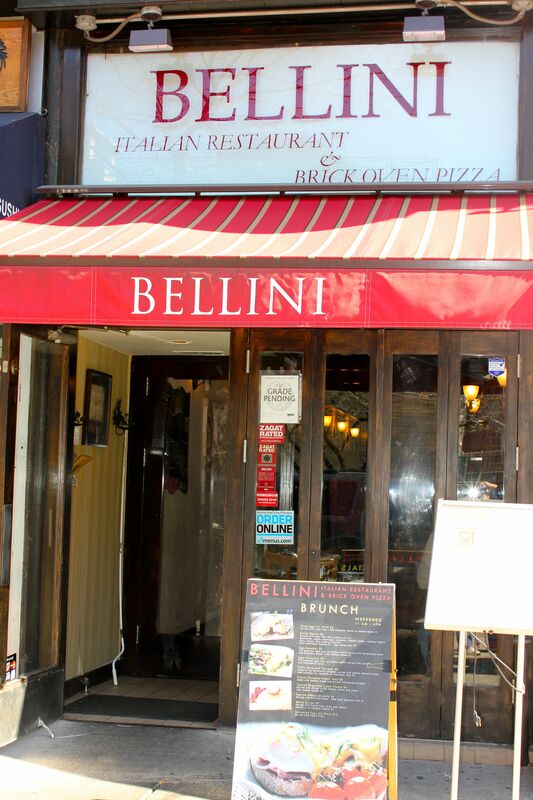 We spent the day in Central Park (while family visited the American Museum of Natural History) and then dined at Bellini’s (I recommend the eggplant parmesan) where a friendly Turkish waiter named Cezar told us he was studying to be a fashion designer. Later in the afternoon, we walked to Battery Park then walked all the way back to Soho! I think during our trip, we probably covered a marathon’s worth of walking! That night we walked to 299 Bowery at DBGB Kitchen and Bar (Chef Daniel Boulud’s “French brasserie meets American tavern”). Pricey, but nice for the occasional splurge. 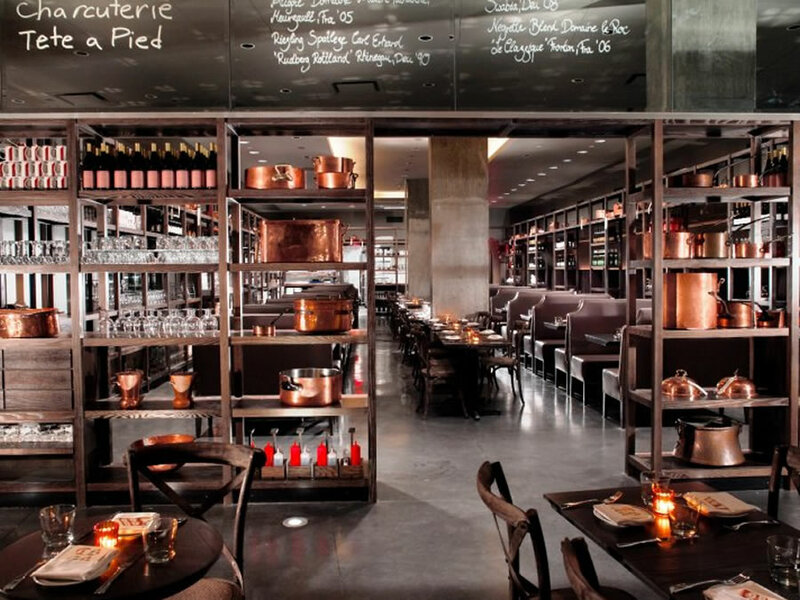 It has an industrial feel to it with shelves and shelves of their cookware, oils and wines stacked within. We had a great booth and were there for a while. My recommendation: Steak Frites. We all shared a Baked Alaska. Excellent! After getting back to the hotel, we secured a nice bottle of wine from the Hampton’s small bar which we took up to the terrace and had a fascinating conversation with a couple of students from Norway on a student visa en route to Texas as the sun set on Soho. 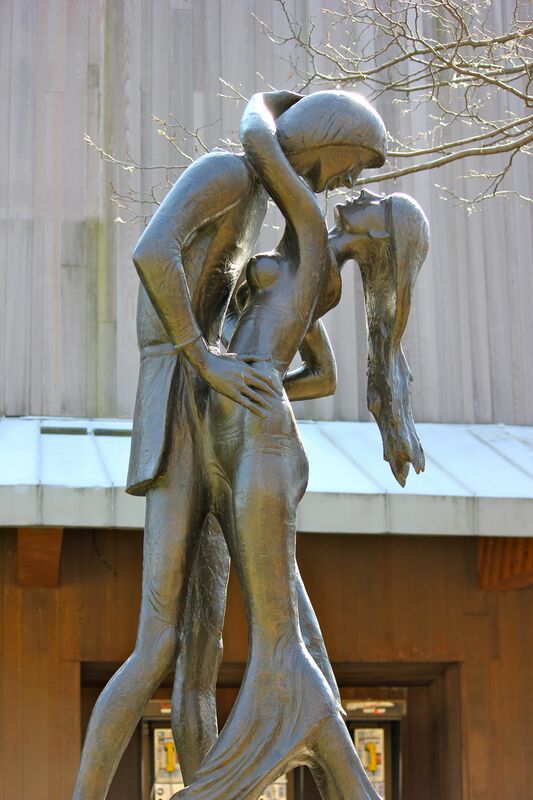 Every time I go into the city, I get new inspiration. From the people I talk to on the subways to the waiters in those cozy cafes to the people from all over the world I have the good fortune to bump into, talk to and get a sense of how they view the world. I wonder when and where these individuals will show up in my writing and what role they will play. But, I’ll take note (whether in my head or when I pull out my Blackberry to record a little snippet of conversation), I store those little tidbits away and let them take root until they decide to bloom into story, a chapter or a character. What people, places or things have inspired you lately? Nice description of Manhattan. I agree that it’s a great city to people watch and as a creative person try to figure out what gets in various peoples thoughts or what their lives are really like. I don’t venture down there enough, perhaps I’ll go down there with a few of your suggested cafe’s or resturaunts. Hi Matt, Glad you enjoyed the post. It’s nicer exploring when the weather is so nice. I usually always stumble across someone or something that inspires! It was extra nice doing so with family. Thanks for stopping by to read! :). Thanks, Sharon. Each neighborhood has a different flavor and I hope to post more of my meanderings into the city more and more in the future. Glad you enjoyed it! :). One of my favorite neighborhoods, Brigitte. And your article did it justice. A friend of mine recently stumbled across a studio apartment there for $850! Yep, you heard me. Granted, it’s the size of a shoebox, but with a location like that, who would ever want to be stuck inside? Hey Carly– Thanks! I like the nearby Village as well. One thing great about the city, you most definitely get your walking in and it’s great on a beautiful sunny day. Can’t believe $850!! Hope your friend was able to take advantage of it. :). Thank you, Aileen!! Inspiration is always a good thing. No, was during the day and with family, but we plan to go back — have heard of Bozic and read the article you’re referring to. Glad you enjoyed my “tour” and hope you’ll stop in again. BTW, your blogs are stellar! Happy Weekend to you as well, Theadora!